Legend PUPPY Salmon and Lamb recipe is a complete and balanced food for puppies, with a unique recipe for a balanced growth. A grain free, rich and velvety puree of Icelandic Salmon and Lamb, made with clean and natural proteins from Iceland’s pristine waters and lush pastures, with all the benefits of the LEGEND functional diets. In it your dog will also find Icelandic water, rich in minerals. 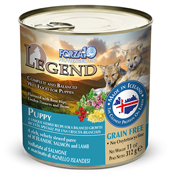 Legend PUPPY puree is best combined with Legend dry food, thus achieving the best blend of palatability and nutritional support, all completely grain free. Ingredients: water sufficient for processing, salmon, lamb meat, minerals (calcium carbonate, dicalcium phosphate, sodium chloride, potassium chloride, sodium carbonate, zinc sulfate, manganese sulfate, copper sulfate, potassium iodide), guar gum, cassia gum, locust bean gum, xanthan gum, vitamins (vitamin E supplement, thiamine mononitrate, pyridoxine hydrochloride, vitamin D3 supplement, biotin supplement, folic acid), dried rose hips, linden flowers, thyme.